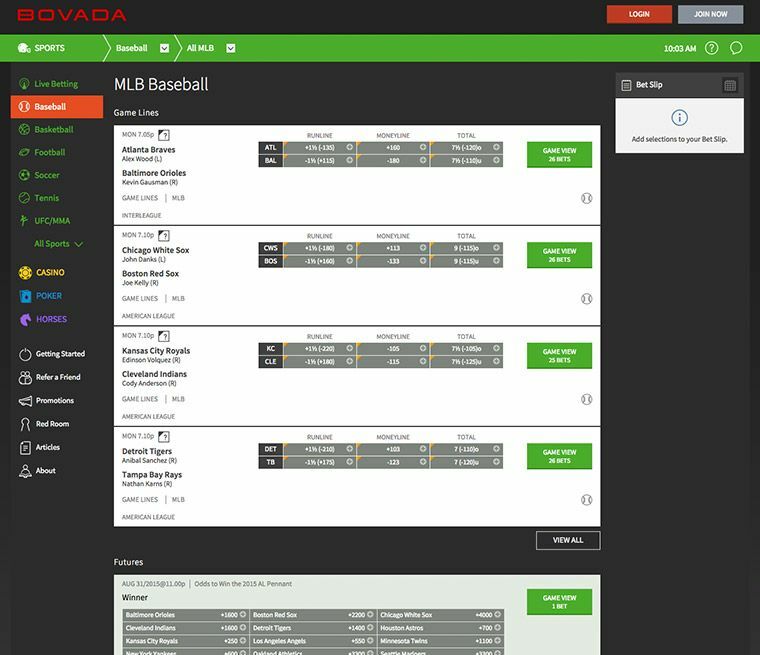 Bovada is one of the largest gaming enterprises out there, consisting of a casino, sportsbook, and poker site. You can use your Bovada account to chop and change between all of their sites, but truth be told, their casino is more than capable of offering you virtually all you might wish to play. Bovada launched in 2011, and is well-renowned as a leading gambling site. Bovada offers gameplay in English, and they also accept the bitcoin as a currency option, as well as US dollars. This casino and sportsbook is licensed out of Kahnawake, and is GLI (Gaming Laboratories International) certified. You may remember a casino called Bodog, which originated in 1995? Well, Bovada is the successor to that site. It takes its name from an amalgamation of both “Bo” from Bodog, and “Vada” from Nevada, the capital of gambling. So, what can you play at Bovada? 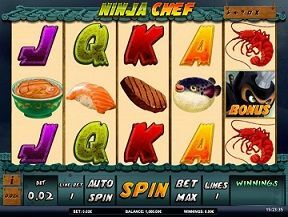 The online casino is equipped with games provided by a number of quality casino software providers. Although they are officially powered by RealTime Gaming (RTG), you can also expect to find games from Rival Gaming, and a few smaller developers, such as Genesis Gaming at this site. Downloadable, instant play, and mobile casino games are all made possible at Bovada. 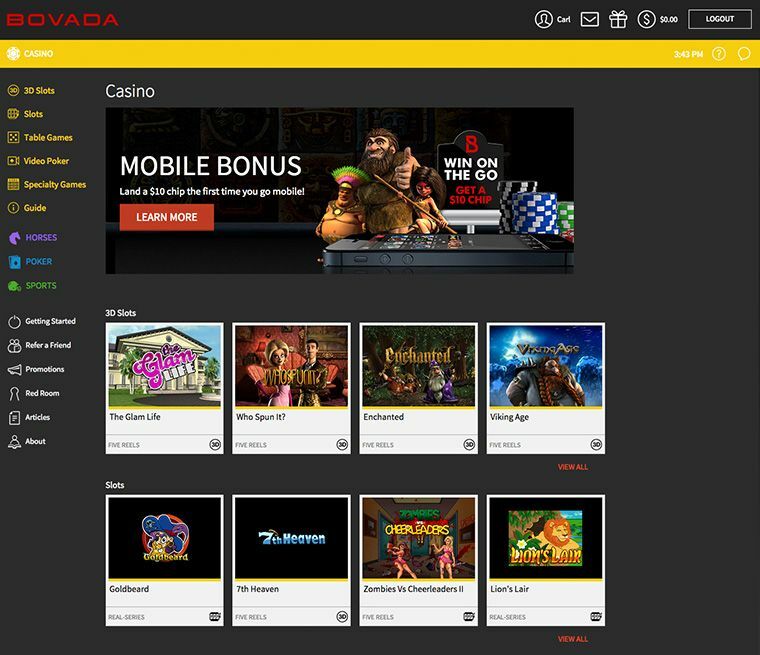 With such a broad range of software from so many developers, there are understandably plenty of games for you to play at Bovada. Their online casino is equipped with baccarat, bingo, blackjack, Caribbean draw, hold ‘em and stud poker games, casino war, craps, keno, let ‘em ride, pai gow poker, red dog poker, roulette, rummy, sic bo, tri-card poker, and video poker games for you to play. Slots are always an option, too, and there are plenty of those in 3-reel classic, 5-reel video, and progressive jackpot formats. Bovada Casino’s hottest slot machine games currently include Bulletproof Babes, Caesar’s Empire, Golden Gorilla, Vintage Vegas, Mystic Wolf, Cleopatra’s Gold, Loco 7’s, Lion’s Roar, and Dirty Mancini. Other major titles include Cirque du Slots, Scary Rich 3, Whale O’ Winnings, and Panda Party. Big progressive jackpot slots include Food Fight, Super Diamond Mine, Jackpot Piñatas, Bulletproof Babes, Sevens and Stripes, and Aztec’s Treasure. It isn’t just casino games that Bovada is into. They also carry a tip-top sportsbook. At Bovada’s sportsbook, you can place your favourite bets on your favourite sporting events. They cover all of the major sporting games which occur throughout the year. If you don’t see your favourite sport listed, keep in mind that it may not be the season for that event. The most popular sporting events covered at Bovada include football, American football, baseball, tennis, the UFC, and basketball. Of course, there are plenty of other events, including just horse racing, which are no more than a click away. Bovada carries promotions and bonuses for all of its sites, but some can be used across those domains. They have the biggest welcome bonus up to $5,000 with Bitcoin. The sportsbook, for instance, carries a Bitcoin welcome bonus which is worth up to $500 in total. Meanwhile, the online casino site has a promotional Bitcoin welcome bonus which is worth $1,500 and which is redeemable three times. Bovada also runs a rather generous 200% refer-a-friend bonus, which can see players pocket 200% of whatever their friend deposits. A casino benefits program acts as a loyalty bonus, whilst special blackjack weekends, Table Mania Tuesday, and mobile casino bonus offers are present an ideal for those niche players out there. Special sporting events may also have individual promotions attached to them for a limited time. More information about all of this can be found on Bovada’s promotions page. Bovada Casino doesn’t feature a wealth of payment methods for you to choose from. However, players can still opt to deposit using bank draft, cheques, money transfer, or VISA if they wish to top up their balance using US dollars. If they wish to use bitcoins, then there is a simple set-up for depositing using this new and impressive, secure payment method. Bitcoins actually come in very handy if you are planning with withdraw winnings. Other payment methods can be fiddly at Bovada, but bitcoin withdrawals are fast. Players will also find that they do not face any fees with bitcoin transactions, and are not limited in how many deposits they can make during any given period. As for fees with other deposit options, there is no fee on your first deposit. A flat 4.9% fee is added to all subsequent VISA deposits, whilst MasterCard deposits are charged with a 6.9% fee. These fees do not include any which your bank may add. Players must withdraw at least $50 via Check with Courier, or $100 via Rapid Transfer. However, there are no such limits with bitcoin withdrawals. This online casino offers customer support to players based in the USA via a toll-free telephone number. Players based outside of the USA may be charged for using this service. The online e-form options at Bovada are free for everybody, though not as quick if you wish to obtain speedy customer assistance. For players thinking of using bitcoins but unsure of how it all works, Bovada have created a handy and in-depth tutorial which answers any questions you may have. Bovada Casino is certainly one of the biggest names in the online casino world to accept bitcoins. This makes them massively appealing to both online casino revellers and online sports betting fans alike. If you are going to go with a name you trust, one with big offers, and one with big games, then you can’t really go wrong with Bovada.